Did ancient Egyptians have electricity? So who was it that actually discovered electricity and took the opportunity to create an artificial light source? Benjamin Franklin and Thomas Edison are the respective gentlemen believed to be the fathers of light or at least that’s the answer that has been accepted as a fact. An impressive hypothesis has been present when it comes to Ancient Egypt as a growing number of researchers argue that we should no longer accept the popular version of who actually invented electricity. They argue that electricity was originally discovered in the ancient world and the Egyptian priesthood was the first to harness the power to illuminate their underground tombs and monuments. Alternative theorists point towards a series of reliefs covering the walls in a dark corner of a crypt in the temple of Hathor at Dendera. One of these relieves caught the attention of a visitor , a Norwegian engineer who had no doubt that what he actually saw, depicted in the wall of the temple of Dandera was in fact, an ancient light bulb. This fantastic revelation spread quickly and caught the attention of engineers and researchers alike, and after studying the relief they agreed that the depictions on the walls of the temple of Hathor at Dendera certainly seemed to represent an electric light bulb. As researchers compared and studied the depictions comparing the different types of bulbs they reached a conclusion: the ancient Egyptians had working light bulbs achieved by what is called “Crookes tubes”. 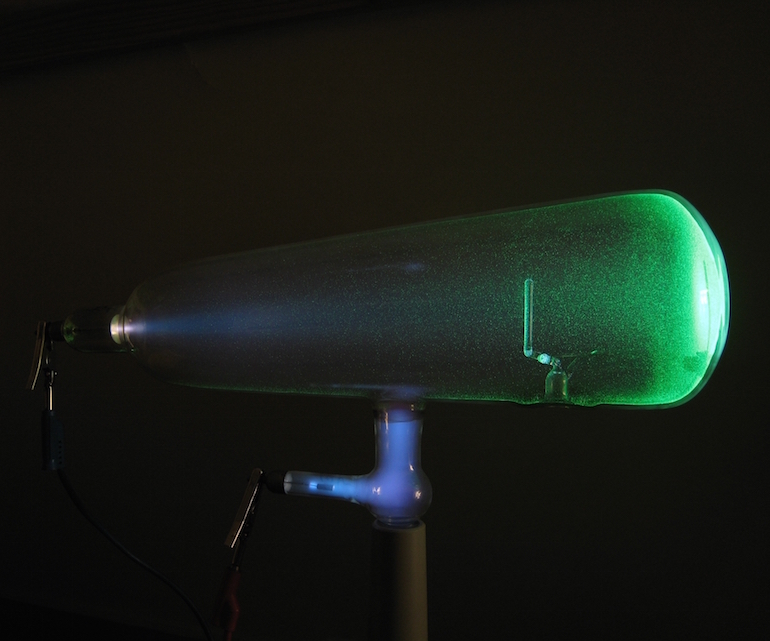 Officially, a Crookes tube is an early experimental electrical discharge tube, with partial vacuum, invented by English physicist William Crookes and others around 1869-1875, in which cathode rays, streams of electrons, were discovered. To understand why electrical engineers and other researchers were excited by the discovery of the dander bulb, and why they believe that the ancient Egyptians had Crookes tubes, we observe the following images, that according to ancient astronaut theorists is evidence that supports their theories. Note the cable from the end of these giant bulbs are plugged into some kind of power source . According to researchers the similarities are immense. 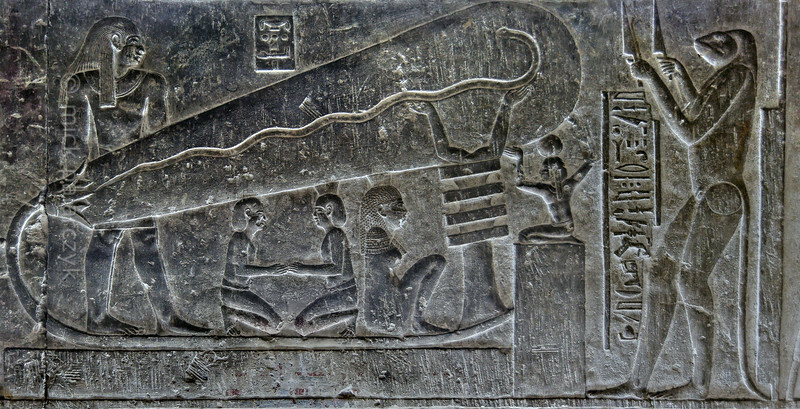 The Dendera Light Bulb could in fact be a device very similar to what we know today is a Crookes tube. Proponents of the hypothesis argue that along the ancient temples of Egypt and crypts, that have extremely intricate designs of sculptures, reliefs and murals exist where there is no light available. The possibility of the use of lanterns and lamps has been proposed throughout the years, but researchers have failed to find traces of soot. The Egyptian mirrors could have been a possibility but a very ineffective one as Egyptian mirrors were made of polished copper and would have not been able top reflect light with sufficient intensity to bounce off of seven or eight mirrors to deliver enough light to the underground chambers. But not only was the mirror an issue, given the fact that the sun actually moves across the sky, ancient Egyptians would have needed to constantly adjust the position of the mirrors to accurately reflect light, making this theory not an option. This fantastic revelation spread quickly and caught the attention of engineers and researchers alike, and after studying the relief they agreed that the depictions on the walls of the temple of Hathor at Dendera certainly seemed to represent an electric light bulb. As researchers compared and studied the depictions comparing the different types of bulbs they reached a conclusion: the ancient Egyptians had working light bulbs achieved by what is called “Crookes tubes”. Officially, a Crookes tube is an early experimental electrical discharge tube, with partial vacuum, invented by English physicist William Crookes and others around 1869-1875, in which cathode rays, streams of electrons, were discovered. See also: Ancient Egyptians space jewelry? 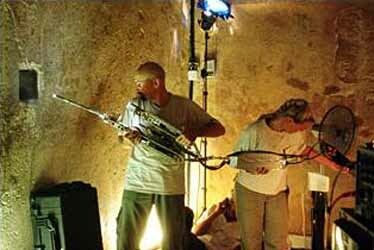 In 1992, German engineer Rudolf Gantenbrink, explored the shafts in the Queen's Chamber in the Great Pyramid using a crawler robot he designed, called Upuaut II. He discovered that one of the shafts was blocked by what appeared to be a limestone door due to its two eroded copper handles. Upuaut II was unable to navigate around earlier explorers' rods that were jammed in the passage. In 2002 the National Geographic Society created another robot, iRobot or Pyramid Rover. The iRobot team had a simple solution to Gantenbrink's problem. They turned the robot 90 degrees and sent it up the shaft gripping the walls instead of the ceiling and floor. In this manner, it was able to ride over the top of the obstacles. iRobot's trek up the Northern Shaft revealed another blocked door similar to Gantenbrink's Door. There are many theories about the purpose of the shafts and doors - some scientific, others pseudoscience. For now the doors appear to be partitions. A robot explorer called Djedi, sent through the Great Pyramid of Giza has begun to unveil some of the secrets behind the 4,500-year-old pharaonic mausoleum as it transmitted the first images behind one of its mysterious doors. The images revealed hieroglyphs written in red paint that have not been seen by human eyes since the construction of the pyramid. The pictures also unveiled new details about two puzzling copper pins embedded in one of the so called secret doors or Gantenbrink's Door. The back of the pins curve back on themselves. Why? What was the purpose of these pins? The loops seem too small to serve a mechanical purpose. The new information dismisses the hypothesis that the copper pins were handles, and might point to an ornamental purpose. Also, the back of the door is polished so it must have been important. It doesn't look like it was a rough piece of stone used to stop debris getting into the shaft. The Djedi robot is expected to reveal much more in the next months. 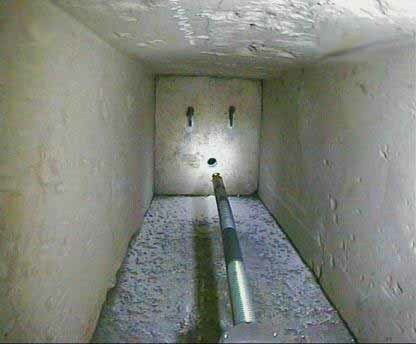 Two shafts, extend from the upper, or "King's Chamber" and exit into open air. 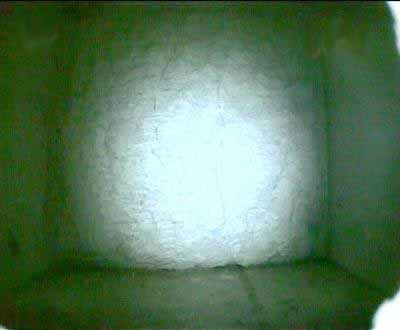 But the lower two, one on the south side and one on the north side in the so-called "Queen's Chamber" disappear within the structures, deepening the pyramid mystery. 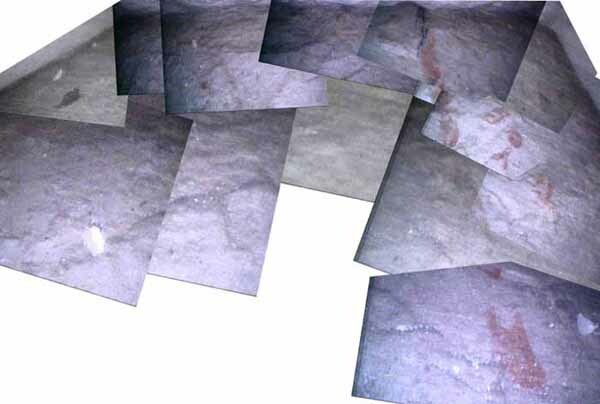 Mysterious hieroglyphs written in red paint on the floor of a hidden chamber in Egypt's Great Pyramid of Giza are just numbers, according to a mathematical analysis of the 4,500-year-old mausoleum. Shown to the world last month, when the first report of a robot exploration of the Great Pyramid was published in the Annales du Service Des Antiquities de l'Egypte (ASAE), the images revealed features that have not been seen by human eyes since the construction of the monument. 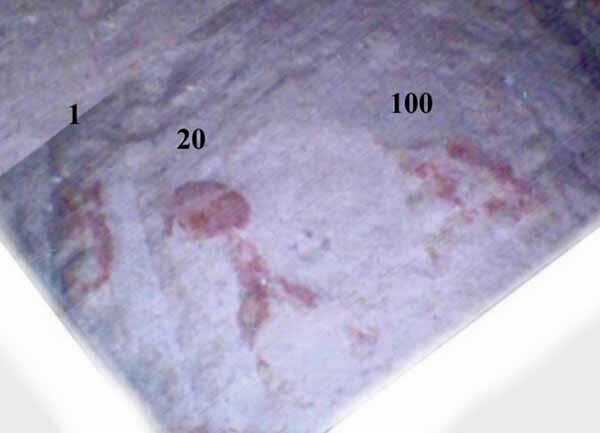 Researchers were particularly intrigued by three red ochre figures painted on the floor of a hidden chamber at the end of a tunnel deep inside the pyramid. Luca Miatello, an independent researcher who specializes on ancient Egyptian mathematics, believes he has some answers. The markings are hieratic numerical signs. They read from right to left, meaning 100, 20, 1. The builders simply recorded the total length of the shaft: 121 cubits. The two main figures are similar to the hieratic number 21. The royal cubit, the ancient Egyptian unit of measurement used in the construction of the pyramid, was between 52.3 and 52.5 cm (20.6 to 20.64 inches) in length, and was subdivided into seven palms of four digits (four fingers) each, making it a 28-part measure. THE BLACK KNIGHT SATELLITE . ELECTRICITY IN ANCIENT EGYPT?? THE INTERIOR OF THESE VAULTS AND PYRAMIDS WERE TOTALLY DARK SO WHAT FORM OF LIGHT DID THE ANCIENT SCULPTORS HAVE? NO SOOT WAS EVER FOUND ON THE WALLS. The following statement was considered controversial or even shocking by some people, so it was my task to post it only after thorough documentation. Please relax and enjoy reading. The head of Cairo's University (Archaeology Department), Prof. Dr. Alaa Shahein has allegedly stated in a conference on ancient Egyptian science, that there might be truth in the theory that aliens helped the ancient Egyptians to build the Pyramids of Giza. Being further questioned by Mr. Marek Novak, a delegate from Poland, as to whether the pyramid might still contain alien technology or even an UFO within its structure, Dr. Shaheen was vague and replied: "I can not confirm or deny this, but there is something inside the pyramid that is not of this world." 1. The Great Pyramids is constructed out of 2,500,000 solid blocks, perfectly aligned! 2. The blocks weigh between 2,5 - 10 tons each. Enough stone for the construction of 25 Empire State Buildings. 3. Initially, the Great Pyramid was covered in limestone. According to Marc Antonius it was visible from 160 km and was shining like a precious jewel. 4. 150,000 stone blocks (10 tons each) were removed in the XIV Century for the construction of the city of Cairo. 5. We are taught that the Great Pyramid was built as a tomb for the Pharaoh Khufu, but the modern discoveries show otherwise. Khufu's name was discovered (in the so called mortuary chamber) inside the pyramid, but nobody speaks about it until 1837! One of the most important Egyptologists, Zecharia Sitchin, discovered that the writing is a fraud and was painted in May 1837. Everything begun with a letter received from Allen Pitsburg who wrote that his grand-grand father witnessed the fraud. Because he objected to this counterfeiting, he was fired from the team and expelled from Giza (Gizeh). After examining the writing, Sitchin discovered that it is indeed a fraud, especially because the counterfeiters MISSPELLED the Pharaoh's name. Instead of Khufu they wrote Rhufu, which for the Egyptians would have been worse than taking the Lord's name in vain, in a Christian Church. 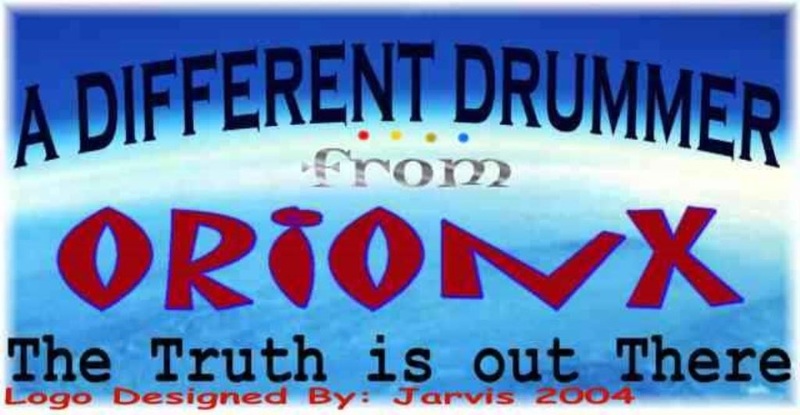 Sitchin concluded: "THIS WOULD HAVE NEVER HAPPENED IN THE ANCIENT EGYPT". 6. Khufu's alleged sarcophagus is almost half his size and carved directly into stone. Not only that the pharaoh could not fit it, but it was also not suited for a royalty. The so called Queen's Mortuary Chamber is sealed by huge stone blocks and doesn't even contain a sarcophagus. The cover up is even more obvious because the official story claims that the Queen was to be cremated after her death. This never happened in the entire Egyptian history because in order for a royalty to become a God, the mummification process was mandatory! 7. NO MUMMIES were found in ANY of the Great Pyramids of Giza. What we learn today as facts can't even stand as substantial theories! 1. Nobody knows what the word "pyramid" really means and no roots for this word were ever found anywhere on Earth. 2. None of the historians' statements regarding the pyramids had been proven. 3. They say that the pyramids were built as tombs for the mummified pharaohs, but NOT A SINGLE mummy was ever found inside the Great Pyramids. 4. The Egyptians had no knowledge of modern geology and without this knowledge it is IMPOSSIBLE for such a construction not to crumble or sink. In the MODERN construction industry, the engineers consider acceptable a sinking rate of 15 cm in 100 years. In 5,000 years (according to the official version, though there is evidence that the great pyramids may be 10,000 years old), the Great Pyramid, weighing 6,350,000 tons (14 billion pounds) sunk ONLY 1,5 cm! 5. In MODERN constructions, it's an extraordinary achievement to keep each side of the building at a deviation of 15 cm (6 inches). But the great Pyramid has a deviation of ONLY 0,75 cm (0,25 inches). This is IMPOSSIBLE to replicate today with our entire modern technology. 6. The stone blocks are placed with a tolerance of 1,000- 2,000 of an inch, so precisely that a razor blade doesn't fit between them. 7. The mathematicians say: during the construction of the pyramids, the Egyptians should have used several very advanced concepts and formulas, which have allegedly been discovered only THOUSANDS of years later. 8. The geographical orientation of the great pyramid is probably the most amazing characteristic. Its sides are almost perfectly placed from N-S and E-W, being almost perfectly oriented on Earth's TRUE NORTH*. How was a civilization from the quasi stone age capable of determining the true North? *The true north is calculated on a map, by using the longitudinal lines, and it's different than the Magnetic North indicated by compass. The true north is located in the arctic regions of Canada and continuously changes its location depending on Earth's magnetic field. 9. The construction of the Great Pyramid shows extraordinary astronomy knowledge. The constructors could measure the day, the year and could precisely determine the Equinox. They knew that Earth is a sphere and knew how to accurately calculate its longitude and latitude. 10. The studies showed that from the pyramid's top an energetic vortex is emanated, that extends in diameter, the higher it reaches. 11. The studies also show that the Egyptian Sphinx is at least 5,000 older than the history books say, which means that is at least 10,000 years old (while others say it could be as old as 15,000 years). 13. According to the official version of history, the construction of the Great Pyramid alone, lasted for 20 years. The slaves worked in groups of 100,000 and were replaced every 3 months. - For the Great Pyramid to be constructed in 20 years, one stone block (weighing 2,5-10 tons each) should have been placed EVERY three and a half minutes, working non stop, 24/24 hours, 7 days a week. It's an absurd statement because we don't have this kind of technology today! 14. The pyramids were constructed in the forth Egyptian Dynasty, which wasn't very aggressive in the first place and didn't even had a very powerful army. But even if it would have been a great military power, the necessary number of slaves could not have been met on an 8,000 km (5,000 miles) radius. 15. The corrupted historians want us to believe that the slaves lifted the huge stone blocks on ramps constructed around the pyramids, and that the ramps were demolished afterwards. - Actually, the effort to build this gigantic ramps would have been greater than the construction of the pyramids. The debris from the Great Pyramid alone would have been of nearly 300,000,000 tones. But where are the debris? This enormous quantity can't be hidden in the desert. 16. These historians also want us to believe that the massive stone blocks were carried to the construction site on massive rolling logs. - The only available trees in the Ancient Egypt were the Date Palms. But these were the primary food source; it is very improbable that the Egyptians would have cut their main food source for this purpose. - The log imports are excluded! At least 25,000,000 logs would have been needed, which is way above the entire Egyptian import industry of any kind, in their entire history. - We should also take into account that the roads were made of stone, which would have made this task IMPOSSIBLE. - But even if the Egyptians would have tried this, the massive stone blocks would have crushed the logs. D. The Egyptians were not the architects, nor the constructors of the Pyramids! 1. It was also suggested that the stone blocks were in fact constructed from a superior type of concrete, not carved from stone. 2. The Great Pyramid is considered to be THE MOST IMPORTANT construction in Earth's history, but there is not a single image, drawing, artifact or inventory list, no registry or depiction to tell of its construction. The Egyptians left us 3,000 years of written and photographic history, covering their entire history, but NOTHING about the pyramids of Giza. WHY? 3. But if the Egyptians are not the constructors of the pyramids, then who is? (Must-read article: The real builders o the pyramids). In 1976, during Viking's mission of exploring Mars, NASA received some shocking photographs. The first one shows a humanoid shaped construction which stretches for miles. NASA refused to photograph the area again, and only after much pressure agreed to take one more photograph. In 1979, Viking sent a second photograph, showing the same structure but from a different angle. In the vicinity of the face, a pyramid (now called DNM Pyramid) appeared. As always, NASA rushed to deny, telling us that what we see it's an optical illusion. Much later, when technology advanced, a special program was used in order to three-dimensionally shape the pictures. The Martian face is 460 m high and over 1,7 km long. The study of other pictures close to that area, show multiple pyramids. This area received the name "The Cydonia Complex". In time, multiple studies showed that the Giza Pyramids are in fact a replica of those from the Cydonia Complex (and both a replica of the stars). Even our Sphinx is placed in the same position to our pyramids, as the Martian Sphinx is placed to the Cydonia pyramids. Going even further, the studies showed that the placement of the Giza Complex on Earth is on the same coordinates as the Cydonia Complex on Mars. 4. More evidence of the connection between Earth and Mars is the city of Cairo, Egypt's capital. Cairo is placed right next to the Giza Complex. But what does CAIRO mean? You will we amazed! Cairo is a Seleucid-Arab word and it means...MARS !!! THE BERMUDA TRIANGLE THEORIES. NO ONE KNOWS THE TRUTH. The Bermuda Triangle is a mythical section of the Atlantic Ocean roughly bounded by Miami, Bermuda and Puerto Rico where dozens of ships and airplanes have disappeared. Unexplained circumstances surround some of these accidents, including one in which the pilots of a squadron of U.S. Navy bombers became disoriented while flying over the area; the planes were never found. Other boats and planes have seemingly vanished from the area in good weather without even radioing distress messages. But although myriad fanciful theories have been proposed regarding the Bermuda Triangle, none of them prove that mysterious disappearances occur more frequently there than in other well-traveled sections of the ocean. In fact, people navigate the area every day without incident. WHO BUILT STONEHENGE AND WHY/ WHAT WAS IT`S PURPOSE? CROP CIRCLES & DESERT LINES. THE NEW UFO DOCUMENTARY THE ELITE HOPED WOULD NEVER BE AIRED IN PUBLIC.